Besides the bilateral Free Trade Agreements (FTAs) that they have individually signed with other countries, each ASEAN member state is a signatory to the ASEAN Free Trade Area (AFTA) between themselves as well as the several FTAs that the regional trade bloc has signed with some of the major economies in the Asia-Pacific region. These include the ASEAN-Australia-New Zealand FTA (AANZFTA), the ASEAN-China FTA (ACFTA), the ASEAN-India FTA (AIFTA), the ASEAN-Korea FTA (AKFTA), the ASEAN-Japan Comprehensive Economic Partnership (AJCEP), and the ASEAN-Hong Kong, China FTA (AHKFTA). These FTAs offer a great opportunity for exporters and importers to trade regionally as well as internationally without tariff barriers. Must have undergone a ‘substantial transformation’ in an FTA member country. For the goods that are partially produced within an FTA member country, substantial transformation guarantees that a meaningful manufacturing process has taken place in the free trade area for the good to qualify as originating. It is important to note that the origin of these goods is dependent on the country where the last substantial transformation is performed. Essentially, for different FTAs, different RoO systems and requirements exist in terms of the methods used to determine the origin of the good. 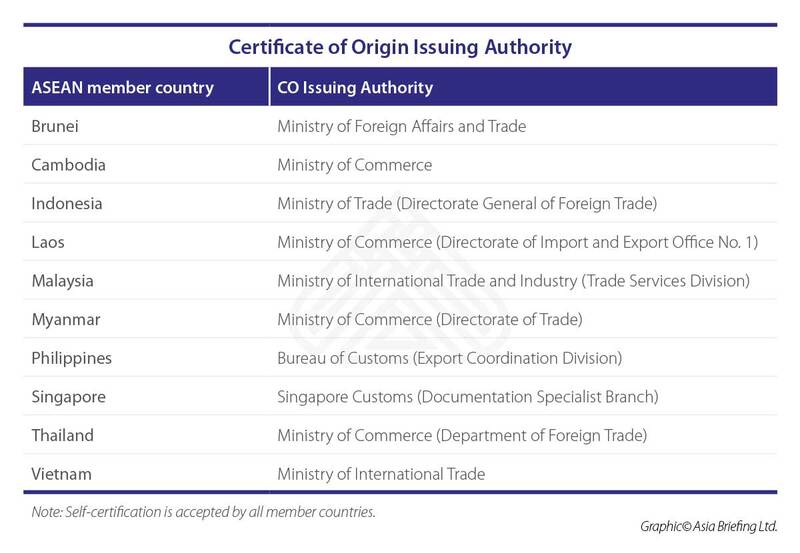 In all cases, regardless of the substantive criteria used for meeting the origin requirement, exporters belonging to a FTA member country must obtain a relevant certificate of origin (CO) for each shipment; verifying the origin of the product to take advantage of the tariff concessions available under the FTA and gain greater market access.